We welcome you to our backyard, where guests of all ages can have fun playing & laughing together in the natural world. Our rustic, yet comfortable facilities inspire nostalgia of times past...when family time didn't compete with technologies, and memories were built around traditions of human connection. *All day packages include Ski Callaghan admission tickets, trail maps, and equipment rentals. The Alexander Falls Ski Touring Centre, located at the first entrance to Ski Callaghan, provides an economical and practical entry port for all of the Beginner (green) trails on the Ski Callaghan network. Here, you will also find Access Callaghan Ski Shop for best value rental equipment and Nordic apparel. We're happy to get you acquainted with the trail map and offer up personalized ideas and tips for a great day out with the family. Take a look at some of our outing ideas below. By the end of your day, kick back & toast some marshmallows by the trailside bonfire or cozy up next the fireplace in our rustic warming hut. Start at the Alexander Falls Touring Centre, rent snowshoes from the Access Callaghan rental shop, and head on out into our beautiful, ungroomed old growth forests for a wilderness adventure, ending up at a frozen waterfall – how magical is that! Start this adventure on the Finger Lakes snowshoe trail, head on straight past the ‘Express’ turnoff until you reach the ‘Alexander Falls Explorer’ signposted turnoff to the left. Head on down through a beautiful forest and keep an eye out for animal tracks through the snow! When you reach the next junction, keep right and you will reach the magnificent frozen waterfall! On your way back, either retrace your tracks the whole way, or opt for the shortcut ‘Express’ route (it’s a little bit steeper!) back to the start of the Finger Lakes trail and Alexander Falls touring Centre. 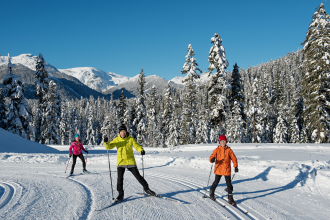 Looking to try cross-country skiing together as a family? Or is it time to introduce the young’uns to your favourite sport? There are plenty of flat and gentle, beautifully groomed trails to enjoy. Starting at the Alexander Falls Touring Centre, you can rent skis and head right out of the door onto easy trails (Twilight Meadows, Madeley Creek Loop) past trees and creeks, and on into the doggy park (Porter’s Glide, Around the World) for gentle laps & magnificent views of the mountains & happy pups. 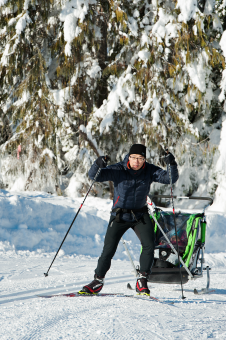 XC SKIING - Start at the Alexander Falls Touring Centre. The folks at Access Callaghan Ski Shop will be happy to set you up with cross country ski rental equipment and a ski chariot to bundle your little one into. From here you can ease into a cross country ski rhythm that will follow the ‘Madeley Creek Loop’ over two bridges, before you reach the ‘Olympic Connector’. From this point you can follow the ‘To Daylodge’ signs that will lead you to the base of Whistler Park’s impressive Ski Jumps. Keep left to head towards the welcoming warmth and treats that await at the Brandywine Day Lodge. This offers a great pit stop to take a break and cozy up with some hot beverages and a well earned lunch. Towing a chariot can certainly burn some extra calories! 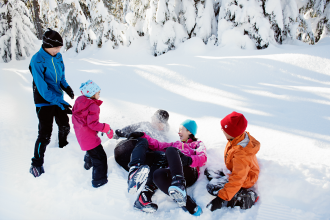 If you’ve got the time for it, guests are welcome to borrow a toboggan from Rainbow Rentals downstairs and head to the Snow Fun zone for some family toboggan time. 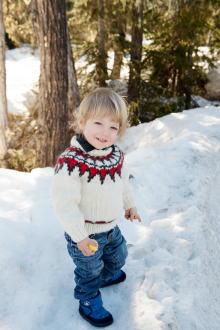 When you are ready, simply ski back to Access Callaghan Ski Shop and head home with rosy cheeks and happy memories. SNOWSHOE - For those wanting a slightly gentler pace, Ski Callaghan has some beautiful winter wonderland snowshoe trails. 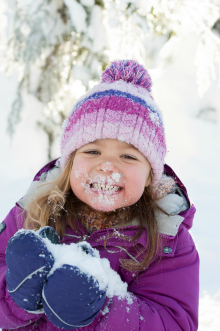 So bundle up your little one into your baby backpack and head on up to the Alexander Falls Touring Centre. Grab some snowshoes from the Access Callaghan rental shop if needed, and head out onto some beautiful trails. For a shorter ‘stroll’, you can follow the Wetland Wanderer trail from the Alexander Falls Touring Base over to the Brandywine Day Lodge for a welcome pitstop and warm-up before heading back. For a bit of a longer snowshoe, head off the Wetland Wanderer trail onto Madeley Explorer which follows alongside the beautiful Madeley Creek for a couple of km, before crossing over and heading back south, joining onto the Biathlon Explorer trail for another couple of km back to the other end of Wetland Wanderer. The best part about Callaghan Country is that we have a multitude of dog friendly trails! So if your family includes the four-legged kind, then don’t leave them out of your family time, bring them along for some well-deserved exercise and fresh air! 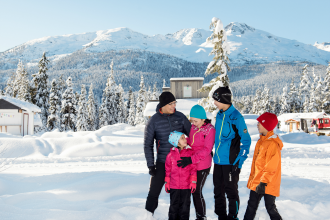 Whether skiing or snowshoeing, there are plenty of on-leash & off-leash options to suit your family, including 9km round trip snowshoe adventures & a 19km roundtrip ski option! Take home tired & happy pooches after a day at Callaghan Country! 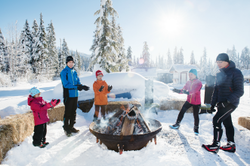 Get the whole family engaged as you set out on a wilderness quest learning fun trivia along the way....In what year did 'The Battle on Snowshoes' occur? What is a good sign of a healthy forest? Stop in at the Alexander Falls Touring Centre to pick up your hunt list and find out. 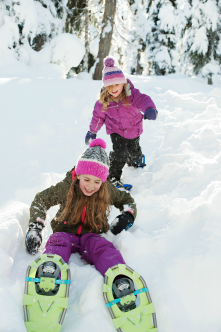 Only half a kilometre long, this activity is perfect for families who are looking to get a taste of the snowshoe experience with "little" snowshoers. This trail has the same feel as our other routes, but stays close to our base area. End the adventure with a great prize item and some stories around the trail-side bonfire.